Now, here is the second course to your romantic Parisian meal: the salad. 1. Begin by roasting the hazelnuts in an oven preheated to 350 ˚F. You will know when they are ready when the skin begins to crack, in about 15 minutes. Wrap them in a hand towel and let cool. Rub the towel between your hands to remove the skin. Chop coarsely and keep aside. 2. Trim the bottom off each fennel bulb, keeping the petals together. Then slice off the top of the bulbs. Remove the outer petals if they seem tough, or peel the outer petals. Finely chop the featherlike fronds, and place in a small bowl. Add one to two tablespoons of olive oil to the fronds with a pinch of salt and set aside. 3. Slice the bulbs lengthwise into quarter inch slices if using a large bulb, or quarter them if the bulb is small. Brush all over with olive oil, and place on a baking sheet/dish. Turn the broiler on high. When the oven is hot, place the fennel to roast until it starts to brown, about 4-5 minutes on each side, al dente! 4.Remove them from the oven and sprinkle sea salt immediately. Carefully spoon the agave on top of each piece and drizzle with lemon juice. Set the marinated bulbs aside for 30 minutes, turning them a couple times. 5.Toss the arugula with some olive oil and a pinch of sea salt. Serve some of the salad on 6 plates. Arrange the fennel slices on top, and top off with a drizzle of lemon-agave marinade. (To make the marinade, simply heat the agave to boiling, and then add lemon juice.) 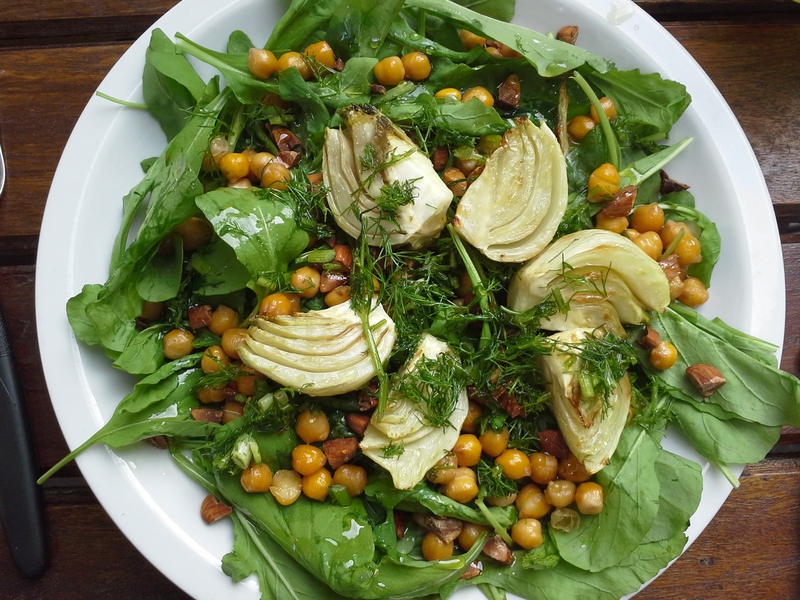 Top with slices of fresh goat cheese and a bit of the fennel frond-olive oil on top. Garnish with the chopped hazelnuts, a pinch of fresh thyme, and a twist of black pepper. Instead of Goat Cheese, for a vegan version, combine the same ingredients with roasted chickpeas and toasted almonds!